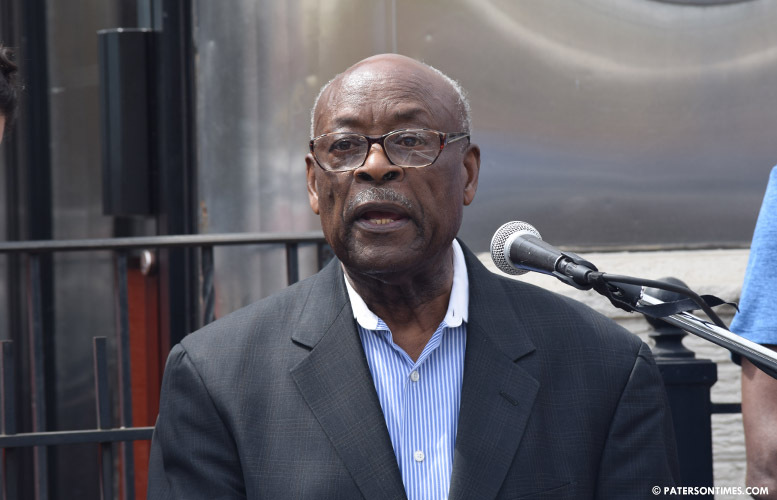 Municipal officials approved a measure to name a portion of 10th Avenue after civil rights leader and local businessman Russell Graddy. Graddy is known for bringing Martin Luther King, Jr. to Paterson. He marched with King in Washington D.C. during the civil rights movement. “You have honored me tonight,” said Graddy, 88, on Tuesday night to the City Council. Graddy vowed to help the city in handling the upkeep of his street — 10th Avenue from East 18th Street to Madison Avenue to also be known as Mr. Russell “G” Graddy Way – by cleaning and planting flowers in sidewalk planters. In 1968, Graddy invited King to visit Paterson. But the street naming resolution does not mention his civil rights accomplishments. Instead, it focuses on his long career as a businessman. Graddy was born in Wrightsville, Georgia. He moved to Paterson at 15. He served in the U.S. Army in Korea and worked for the Wright Aeronautical in Wood-Ridge. He has opened a number of successful businesses. He still owns and operates Mr. G’s Restaurant which specializes in southern cuisine on 10th Avenue. Mimms sponsored the street naming measure to honor Graddy. One of few truly successful black businessman. Pays his bills. Pays his people. Isn't a fake like Michael Jackson.